I have a press release from B&N sitting in front of me. They're extending the Father's Day sale on the Nook HD and Nook HD+ that they have been running for the past week, and they'll be keeping the prices the same indefinitely. For a "limited time" you will be able to get the 7" Nook HD for $130 and 9" Nook HD+ for $150, killer prices that are far below the price of their immediate competition, the Kindle Fire HD Android tablets from Amazon. Just to put things in perspective, the Nook HD is priced at 35% less than regular retail, while the Nook HD+ is priced at 40% off regular retail. Given that this is the second sale in less than a month, and given that the sale prices are costing B&N a lot of money with each unit sold, I would suggest that we are looking at a clearance sale in all but name. B&N is getting out of the hardware business. Extending this sale is just another way to clear out hardware as expeditiously as possible (with the added benefit of not having to call it a clearance sale). It's a shame that B&N is giving up on these tablets; they're pretty nice devices. The Nook HD is a 7" tablet with a 1440x900 resolution screen (the highest of any 7" tablets). It's running a proprietary version of Android on a 1.3 GHz dual-core CPU, and it ships with 8GB or more of Flash storage.. The Nook HD+ is a 9" tablet with a 1920x1280 resolution screen. It too is running Nook Media's own proprietary version of Android on a 1.5 GHz dual-core CPU, and it ships with 16GB or more of Flash storage. Both tablets have Bluetooth and a microSD card slots, but neither tablet has a camera. That put them at a disadvantage once they gained Google Play in an update just over a month ago and entered the general tablet market. Most $199 Android tablets released last year have at least one camera, and the new Nexus 7 is expected to have a pair of cameras. I can't help but wonder if B&N looked at the specs on the tablets coming out in the next few months and realized just how under-equipped the Nook HD really is. They may have wanted to get the hardware out the door now, and were willing to take a painful sting in the pocketbook to do so. That fits with the clearance sale that B&N's retail partners had for the Nook Touch last month, and it tends to support the buyout rumor that has been circulating. In early May 2013 Techcrunch reported that Microsoft was going to make a billion dollar offer on Nook Media. Microsoft has unofficially denied the buyout rumor but the denial comes across as less credible than the original rumor. As it stands, B&N is cutting back on software development and clearing out hardware (including an ongoing sale on the Nook Touch and Nook Glow in the UK). 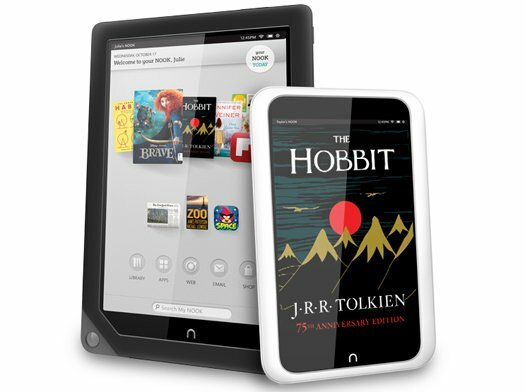 If they're not entertaining a buyout offer then they are planning to simply shut down the Nook platform. I'm betting that it is one or the other, folks, and I'm really hoping for a buyout offer. A shutdown would hand the ebook market over to Amazon, while a buyout would at least prolong the struggle a little while longer. P.S. If anyone at B&N, Nook Media, or Kobo wants to leak details about the Rakuten offer, you know where to find me. Thank you for the post, but might I suggest a better division between the official press release and your conjecture? The content of the press release (which would be good to actually cite) is limited to the extension of the sale. While one couldn’t be faulted for coming to the same conclusions you do, it mentions nothing of leaving the hardware business. I’d say the list is a pretty clear divider. Also, the first sentence of my conjecture contains the words “I would suggest”. I agree, the title was intentionally misleading. Just a simple question mark at the end would have let me and others know that it was sheer speculation. Sensationalism makes for bad reporting. Okay, that is just mean. There is a whiff out there of Rakuten bidding for Nook? It would be a pricy way to buy customer access, especially since nothing stops Nook owners from buying from Kobo now. Unless they lowballed them…? I expected the MS deal to have been closed by now. Since it hasn’t been announced I have switched to my second choice. Or maybe it’s Google doing the buying and they have to get rid of all PC, MAC, and iOS support before it closes. Choices, choices… which on to bet on. My money is on Google. Google would want everything, just in case it was useful. Its a pity in someways but if no one is buying the tablets, then this is the only way to go forward. I quite like the Nook HD I have, although I was thinking of replacing it with a iPad mini because an iPad is easier to hold in the hand due to its square shape and I want to consolidate all my books into one platform. Nook has really no idea how to market this tablets. If you are a parent, a tablet in which you can lock it down for a kid so easily, and also has no camera (which is handy for privacy reasons) would be a bonus. its also pretty robust too (I dropped it onto a tile floor 7 ft in the air and it didn’t break). I was given a year ago the original Nook Tablet (the one that came after the Nook Color), and because 98% of the time I used it only for reading, I was wholly satisfied. Then I got a coupon offer from B&N (I’m a member) that would let me buy the HD+ with 32GB for $165. I hemmed and hawed about buying something I really didn’t need, but in the end, I caved and bought the HD+. My original Tablet is starting to gather dust. The HD+ is fantastic for me. I’ve actually watched a couple of Netflix shows on it and even spent a few minutes surfing the web, but again, more than 95% of my use is reading and I really like it. I was in my local B&N on Saturday as I wanted to buy a second power supply for the HD+ and I was surprised at how long the line was to buy the tablets. There were 7 people in line when I arrived — 3 bought the HD and 4 bought the HD+. After I bought my power supply, there were another 3 people behind me. I think that if B&N were to look long-term, it would find that the sale price is the right price and would increase units sold, which would lead to increased content purchases. They should view it as a typical Amazon move: sell the hardware low and encourage content sales which is a repeat business. As for the lack of a camera, I never even thought about it. I’ve never taken a photo with my cell phone (I’m still using an original Motorola Razr) and certainly didn’t expect to take photos with a 9-inch tablet. I suspect that most people would use their cell phones to take pictures not their tablets. Except they were already selling the hardware low. Now they’re selling it at a price that won’t ever generate a positive return. Because they don’t have a camera on the “front,” the NOOK models can’t be used for Skype and the like. Tablet cameras aren’t necessarily intended for snapping photos. In my personal opinion, a merger with Kobo would make the most sense for NOOK. There would be significant cost savings in merging the platforms, and the resulting player would have a strong market position in ebooks. It would be a strong number one in Canada, a solid number two in the US and UK, and a very good position going forward in Japan, and plenty of international opportunities. Might Samsung buy them to get the Nook store and all the existing accounts? Kill the B&N fast obsoleting hardware but get the store? Use the store to sell their own hardware to all those book account holders? I saw Samsung at BEA but wonder how they can get a viable storefront off the ground fast. Ultimately I only see Samsung, Apple, Amazon, and Google in the tablet/phone space all with substantial “razor/blade” business models (e.g., hardware/content). Apple could buy B&N Nook also to really jumpstart their ibook share versus Amazon. (But, hey…I am not even allowed to sleep in a Holiday Inn Express so what do I know…) How many B&N Nook accounts are we talking about I wonder? Samsung is not out of the question, though I think they are a low probability option. I’m not convinced the billion it would cost would be worth it for them. “The billion?” Really that much? I seriously doubt that as the hardware will be just about worthless to anyone with a sustainable business model very soon. The value is in the customer base but that value declines every day that goes by as those people switch to better hardware options from others and read elsewhere. On the retail side of B&N, why don’t they create store-within-store small retail concepts to go in supermarkets and mass merchants like everyone else and their brother? Bring POD with them. Maybe they have already? That customer base could explain the clearance pricing. B&N could be trying to get the numbers up in order to make Nook Media more appealing, never mind the cost. You could buy Barnes and Noble — all the retail stores, all the college stores and the 80% or so of “Nook Media” it still owns … for $1.1B based on today’s stock price. You would be buying Chairman Riggio’s share paying him abt $350M. Something tells me he’s not selling. Nook Media (hardware, software, college stores) represents the part of the business that’s losing money hand over fist and only has future value if the stars all align. Anyone really think this is worth hard earned $1B? Sure, in Google money, but not as a rational purchase. I agree that the heady mark-down of the inventory suggests these are end of line — but Nook could be getting ready to release a new eink and a new tablet but wants none of the old models kicking around the warehouse. B&N reports year end results tomorrow so perhaps we will get a glimpse fof what’s up and what’s next at that time. Selling Nook Media would accomplish his goals nicely, so the only sticking point would be the price. And you’re right; a billion dollars for Nook Media would be overpriced. This B&N situation reminds me so much of Palm in the late 1990s. Their founders left during the heyday to found Handspring, which never made it. Palm innovated with a single-purpose contact manager and then got swept away by the multi-functional options, same as ereaders and tablets/phones. As the old print book industry continues to consolidate (a thirty-year trend now), I note they are proving that marketing adage known so well in other categories: there is only room for two dominant players in any market (gorillas). Numbers three and four (the monkeys) can hang on while all the chimps that come and go get wiped out in tough times. So in this market I would think Apple and Amazon would be the gorillas for ebooks (hardware/content model) with Samsung and Google becoming monkeys. But if Samsung buys the Nook customer base and storefront, then they would surpass Apple in the ebook business. I still do not really know how much Apple cares about ebooks versus music. I wish their ebook share was stronger. Maybe you know? Thanks. Samsung and Google are the monkeys of this market, yes, and so is Sony. But the only reason Apple is a gorilla is that they have so damn many devices. Otherwise they would be a monkey as well. In fact, I would call Apple a chimp, not a gorilla. Apple wants people to believe they’re a gorilla but their market share, whatever it may be is coming from a small fraction of the users of their oh-so-abundant multifunction devices. The Nook customer base, like Amazon’s, comes primarily from heavy readers. And ridicuously loyal ones at that. Apple probably needs ten iOS customers to get the ebook sales that come from one Kindle PW or Kobo Aura. And that is *after* factoring in their higher prices. Samsung is the real wildcard here; their multifunction device install base is approaching the size of Apple’s so if they choose to partner with an established vendor (ahem, Nook) and actively promote that ebookstore, they would very shortly be running in baby gorilla territory. The size and *type* of customer base factors in the price so, losses or not, whoever buys Nook will be paying closer to $1B than, say, the $300M Rakuten paid for Kobo. is indefinitely really the best word to use describing the press release, when it does specifically mention it is a limited-time offer, though not giving a limiting date for the extension of the father’s day sale? i realize indefinitely means either permanent or without a set end, but it seems to often give inference of permanence? If you interpret it that way (as Nate seems to have done) then limited-time offer = clearance. Agreed the book interest of the B&N list is a great strength. I wonder how big that list is? We already know that reading books is not as popular as taking and sharing photos, using maps, or listening to music, yes? So what is the size of the B&N customer database and what is the average value per reader? Did that growth start strong with early adopters and then hit a wall? I do not follow them closely but maybe someone else knows these answers? My own bias assumes with no data that Apple is more appealing to women as easy to use or mainstream if you will than the Android providers and this is their core advantage. Plus Amazon and Apple have so many customers to market ebooks to versus B&N stuck with one fairly small class of goods in books. They can do so much with cross-merchandising. If the Nook goes away, where will those readers migrate? Did they choose B&N because they refuse to buy from Amazon? It used to be 20% of the OS market refused to buy Msoft for instance. I would think Apple is the best affinity for that B&N alternative shopper psychograph blah blah blah. I don’t believe that they’re losing money at these price points. There might be no wins either, I don’t know. However, last time I checked a couple of months ago, cheap Chinese tablets with even better screens and HW specs cost less than $200 in single-piece quantities. I would expect B&N to obtain their devices at volume costs. By now, it should well be possible to produce the hardware at costs per item at least equal to their current selling prices, if not less. Amazon prices their tablets to sell near cost, thus forcing everyone else to match them. That includes Kobo, which passes the Kobo Arc to retailers at a 5% margin, and B&N, which also had to pay for a cutting edge screen tech. If Kobo only offers retailers 5% on the sale of a not-as-good tablet then what makes you think B&N is making a lot of money, much less getting a 35% margin? As I said, I don’t know whether or not they’re making or losing any money from their devices. I just speculated that they might not be losing any if they sell for the price that they pay. You could argue that that might effectively cost them money, although on the other hand they bind customers to their ecosystem. They might already have made enough money from earlier sales at high prices so that they can afford to make no profit for some time. Since you can regularly buy devices like http://www.aliexpress.com/store/product/Pre-Sell-VISTURE-V4-HD-9-7-inch-Android-Tablet-2048-x-1536p-Retina-Display-RK3066/700168_646791636.html that have similar or better specs (in this case, larger screen, higher resolution, more RAM, additional cameras) for not much more than the Nook HD+, I would expect that it must be possible to produce the device at the cost that they’re selling it currently. However, that is just my personal assumption. I should perhapd add that the link is a bit misleading. It is not a “Pre-Sell” device as it says and it is also not the V4 model. They probably just updated the offer and didn’t change the URL. The V4 is the predecessor (which I personally own) of the current V5. The only difference is that the V4 has 1GB RAM whereas the V5 has 2GB. The V4 was sold for $189 when I bought it in December or so, IIRC. After that, the V5 was available at around $220 when I first saw it, which was then $20 more than the V4. The latest hotness is the V97, which you can buy from the site for $230. While it has both better camera (5MP instead of 2MB) and processor (4-core CPU insted of 2-core) hardware, I think you can see a pattern: early birds pay $220-$230. After a while, when better hardware is sold at that same price, prices drop to $200-$190. I speculate, that costs for producing the older hardware don’t really fall that much but rather, that there is a larger win margin at the beginning of the product cycle. Then again, I’m no expert, and this is all pure speculation. To summarize my opinion, the current sell-out prices might just indicate that newer, better hardware is under way. Obsolete hardware that still has the highest resolution on the market. So they are (finally!) very aware that active accounts are worth something – to the success of the Nook business itself, and it’s future sale. I just can’t figure out who would be that desperate to buy them, no matter the price. Nook hasn’t really established itself as a gaming, video or music platform, and they just handed that part of the market off to Google Play, anyway. I don’t think the device manufacturers like Samsung and Apple really need reader accounts – Apple has iBooks and a huge iOS user base, Samsung has the Android apps. I doubt Google is a suitor, or B&N wouldn’t be in such a hurry to dump hardware running Android. But why partner with Google Play if Microsoft was serious? I never really understood why MS invested in Nook to begin with, frankly, but when have they needed a reason before? Sony already tried using Borders bookstores to move devices and it didn’t do much for them, but they could use and actually integrate the Nook account lists fairly easily, since they have a US and UK webstore already. But I don’t see them spending serious cash for names. And then we have Kobo, but only if Rakuten feels like investing more – Kobo itself doesn’t have the pockets. And what do they really need from Nook – just the accounts. I just don’t see an immediate buyer. And I don’t think B&N can continue to subsidize Nook, or bother to launch new devices and open in new markets, two things they need to do to grow. The tablets would have been worthless without Google Play. Hardly anyone was buying them. Maybe, but the price drop in two countries seems to have moved more devices than the Google Play addition did. If no one ponies up for Nook Media, B&N could license e-Ink devices from someone else (Sony or Kobo), rather than take the hit on developing their own. Sony would be the easiest – just make Nook for Android part of a firmware update. They’ve got the app market covered already, although Nook for Web needs work. Or total pipe dream – maybe they can get the publishing industry to loosen up DRM and sell for all devices. That would be a riot! Then they can just sell books and subscriptions. They’re dropping support for PC and Mac and only keeping support for Win8 because they are contractually obligated. Very interesting. To me this all smacks of “Big Boy” hubris. There is nothing more difficult and demanding than being in the hardware business (I worked in GPS for years and very few companies can manage all the “moving parts.”) I just never saw and still do not see B&N as a viable player in the cutthroat hardware business. But their history reveals this hubris. They began as a bookseller but got into publishing, which annoyed the publishing world no end. (Sounds like Amazon today, yes?) Anyway it does seem that something significant is afoot. Having said that…Father’s Day is sort of the last gasp for hardware sales before the slow and painful sales months of summer come along and if the sales were not great, extending the sale is commonly done through June. sony buying nook media would be choice! what a hubbub that would be. but alas, not meant to be. in the meantime, unlocking B&N nook tablets to google play pacifies the buyers who get left behind when B&N switches to the windows OS. makes sense to me.